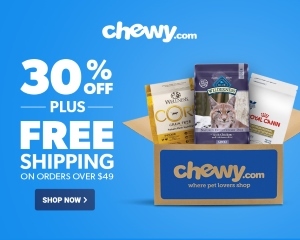 You want the best for your cat, and while you may be picky about what foods you give your cat to eat, are you as picky about the kind of litter they use? Most people don’t give much thought to the litter they buy for their cat, thinking that any litter will be just fine, but then they wonder why their cat doesn’t use the litter box or becomes ill all the time. 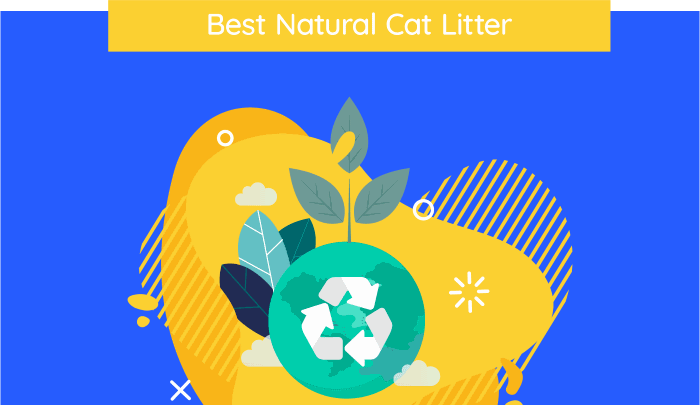 There could be a problem with the litter they are using, and we want to show you a few natural cat litter products that can change your cat’s litter habits and make them healthier animals. Below are some products that are made from natural components and that are safe for cats. These are our top choices from what you’ll find available on the market today. 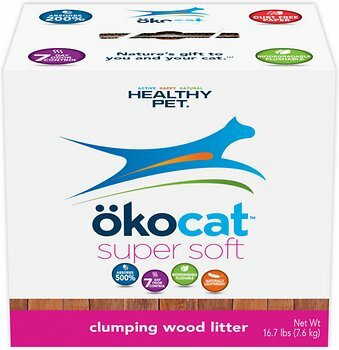 This brand of litter is known for being very absorbent. In fact, the manufacturers boast of it being able to absorb five times its own weight before becoming too messy to handle easily. It’s also renowned for its odor control, which can handle multiple cats and their odors for up to seven days. Because this is made from natural products, this litter can be flushed, if you want to get rid of it that way. It’s also biodegradable, so no matter where you toss it, you don’t have to worry about it having a negative impact the environment. It’s just as safe for the environment as the droppings and urine your cat leaves in the litter box. 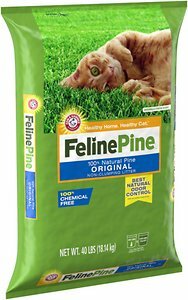 Even though it is a neutral cat litter, you don’t want to flush Feline Pine down the toilet. It may boast of flush-ability as one of the benefits of natural cat litter, but the truth is that not all cat litter that is made from natural ingredients fits this talking point. 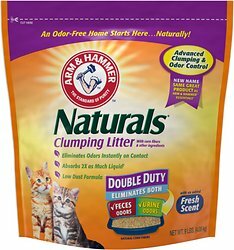 You will also find this to be one of the costlier natural kitty litter options, but there are definitely some benefits to using it. It kills odors on contact, so you should have little problems with bad smells in your home. It’s also very absorbent, but the litter will not clump together as the cats use it, so you probably have to empty the entire litter box at once when it is time to get rid of old litter. 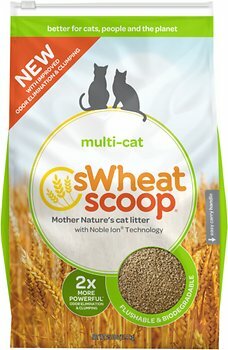 This is one of Catster.com’s top picks for natural cat litters, and it is one of ours as well. Yes, the price is a little high, but it may be worth it to you to have a clumping cat litter that prevents dust tracking in your home and that provides all-natural litter that is safe for your cat. This one is designed for homes where there are multiple cats living, and it comes recommended by veterinarians because most cats love it. Of course, the odor control is great too, and it protects your home from the smell of your cat’s urine and excrement for up to a week, even if you have multiple cats. If you want a cat litter that your cats won’t be able to make dusty paw prints out of all through the house, then you need something that clumps well and that absorbs the urine from your cats quickly and effectively. Blue Buffalo’s litter is designed to do that, but it can absorb too much urine too quickly and become muddy over time. You may have to replace the litter more than onece a week, in some cases. The ingredients are all natural and environmentally friendly, so you don’t have to worry about the presence of toxic chemicals, and you can treat this litter like any biodegradable product. Arm & Hammer uses what it calls a low dust formula to prevent tracking and to keep your house looking clean, even while the litter eliminates odors and keeps your home smelling good. This clumping litter absorbs urine effectively and makes it simple for you to scoop out the litter as it is used. It’s a very absorbent litter, though, so you don’t necessarily have to scoop out used litter immediately. It may still have some absorbency left to offer that can keep your litter box smelling nice for a long time to come. While we are going to recommend certain cat litter products to you, it’s possible you may not find one of these that meets your needs or that is appealing to your cat. That’s why we want to take a moment and discuss some things you need to know about buying the best cat litter for your pets. 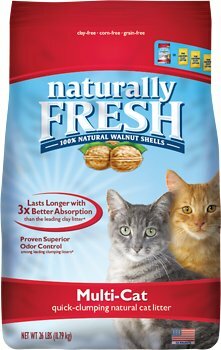 Pick the right type– There are a few different kinds of cat litters- corn, paper, wheat, walnut and paper (as MoneyCrashers.com points out)- and you want to choose something that is safe for your cat. So, you need to be aware of any allergies your cat has and preferences for one type of litter over another. Beware of false claims– Just because a product claims to be natural, that does not mean that it is. It may contain some natural components and some toxins and chemicals that you don’t want in your house or near your cat. Our picks are all ones that have been extensively safety tested, but you need to do your own research on other products you are considering. Don’t start with a big bag– You really can’t be sure how your cat is going to react to a new kind of litter. It may love it, or it may not want anything to do with it, and you need to find out how it feels about the litter before you invest in a large bag. Buy for the number of cats you have– Some litter isn’t suitable for multiple cat houses, and if you have more than one cat in your house, then make sure that your litter can keep up with the mess they create and the smells they may leave behind. We have given you a few options, but of course there are many more out there for you to pick from. We think natural litter is the best, and it is definitely safest for your cat, but you need to choose what fits your needs and what is right for your pet.